How many rate cuts is it going to take to kick start growth in Brazil? The 50 basis point cut is the 7th cut in a row and marks a drop in rates to record lows of 8.5%. While many apparently doubt whether growth will be kick started, this unprecedented move will undoubtedly usher in huge growth as 2012 ends. Combined with the country getting ready for the World Cup in 2014 and the Olympics in 2016, these rate cuts will put growth into sizzling status for 2013. The amazing part is that interest rates have now dropped below the 8.75% reached during the financial crisis in 2009. What happened next was boom times for the stock market as 2009 ended and 2010 started. 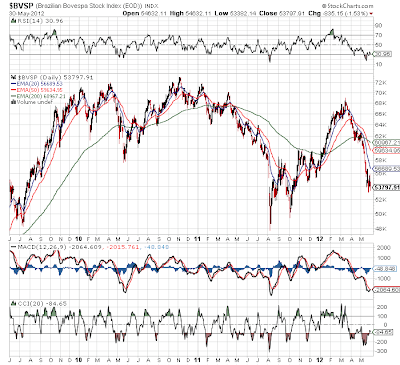 Unfortunately that's when the Bovespa peaked in this cycle. Back then, inflation kicked up big time as commodity prices plunged in 2008 and then rebounded sharply by 2010. The year over year change over amplified some of the inflation fears back then. The 3D Modeling/Rapid Prototyping (RP) technology sector promises to change the world. The RP technology allows for a design tool that greatly improves the product development cycle by allowing rapid creation of models for testing. Read this article for more information on the sector and leaders. Unfortunately the concept has limited commercial production capabilities and material challenges. Over time, these will naturally become less and less of a problem. For now though, several sectors such as aviation parts and medical devices can benefit greatly from the ability to RP. Not to mention, any wealthy person that wants to make their own iPhone case at home. The 3D Printing concept has been around for awhile, but it is just now becoming a mainstream reality with sub $10,000 commercial printers and sub $1,300 home printers. When listening to the Q112 earnings call this week for Pandora Media (P), it really struck me that this company was mostly built on the old business model. Sure, companies such as Pandora, Angie's List (ANGI), and Yelp (YELP) have new relevant services, but none of them have veered much from the labor intensive model of hiring local sales reps to find advertisers. The Pandora earnings call had one very shocking number. The company had hired 79% more sales reps than last year. Sure, the company told a great sales story of how a local car dealership found advertising on its services more compelling than terrestrial music channels since the ads could be more targeted. When, though, will these companies attract advertisers without a sales rep and large marketing budgets? The Thomson Reuters/University of Michigan final index of sentiment climbed to 79.3, the ninth straight increase, from 76.4 the prior month. The gauge was projected to hold at the preliminary reading of 77.8. The ninth straight increase is a record. Interesting as it shows that Americans are finally moving past the European crisis. Cheaper gas and a better housing market is helping pull the American consumer forward while the downside risk in Europe is apparently wanning in the mind of consumers. Even more interesting was news that German consumer confidence is expected to hold steady and France confidence increased in May to the highest levels since Nov 2010. So does this mean the feared markets collapse in 2012 won't be a reality? Has the market got it wrong that a repeat of 2010 and 2011 is on the way? The market has a way of disappointing when everybody thinks one way. Three years in a row would be too much of a pattern. Ever since Facebook (FB) filed in a S-1 prior to the IPO that it was struggling to monetize mobile ads, the sector has been crushed. Both mobile ad network Millennial Media (MM) and mobile ad agency Velti (VELT) were absolutely crushed. According to the Millennial Media CEO appearing on CNBC yesterday, mobile is monetizing just fine. The selloff was clearly over done and another example of a hot IPO that can be scalped in the after market at favorable prices for investors willing to be patient. Those chasing the initial nearly 100% surge were hammered. Not much to tell from the chart so far, but a potential bottom occurred last week. Great interview from Bloomberg with Elon Musk. Musk was a co-founder of PayPal and the CEO of SpaceX and Tesla Motors (TSLA). He has done some incredible stuff by developing an electric vehicle manufacturer and a space company. Unfortunately as anybody following this blog probably knows we're just not fans of investing in a company such as Tesla that has a part time CEO. Even a CEO as talented as Musk. Anybody paying attention probably knows that SpaceX recently launched the first private spaceship headed to dock with the International Space Station. An incredible feat considering the difficulty and expense that NASA had run into in the last decade. The more incredible stat that I read was that SpaceX has spent less money to develop a spaceship than the $1B Facebook (FB) spent on Instagram. Now isn't that a sign of the times! Prior to the market open on Monday, Lowe's Companies (LOW) reported earnings that generally met expectations. Unfortunately, though, the stock sank roughly 10% as guidance disappointed the market. The home improvement retailer still sees a weak housing market contributing to the soft guidance. Competitor Home Depot (HD) had some similar statements last week. The market didn't hammer it as badly, as investors see Home Depot as taking market share. Its stock is actually up over 1% during the day, confirming that most investors think the issue is Lowe's related. So most investors are left wondering what to do with the stock now. A little over eight months ago we wrote this article about some under the radar Eagle Ford Shale plays. While Carrizo Oil & Gas (CRZO) and C&J Energy Services (CJES) might be better known stocks, both have struggled even as the liquids rich basin has produced strong earnings for the companies. The market clearly has lumped both of them into the nat gas price collapse. Riverbed Technology (RVBD) announced the doubling of the existing buyback program to $300M. This amounts to nearly 12% of the company. While our firm is a big fan of buybacks for large established firms, it isn't always the best use of capital for a company with a $2.5B market cap. Typically we'd rather see them spend the money or make an accretive deal. 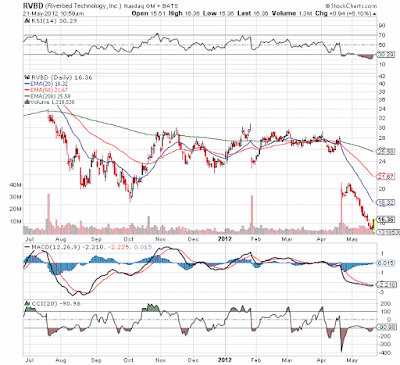 In the case of Riverbed though, it really is difficult to argue against at least the threat of a significant buyback. The stock has been absolutely crushed and if you believe management it is on the verge of a major new product explosion. The one fact that shorts or just sellers of the stock seem to miss is that Riverbed is a cash generation machine. The company has $600M in cash and will generate somewhere around $150M in positive cash flow this year. In essence, the doubling of the buyback will come directly from cash flow each and every day. With the massive Facebook (FB) IPO out of the way on Friday, investors can now get back to investing in good companies where the IPO hype is gone already. With the business media networks spending countless hours analyzing the Facebook IPO, investors learned an important lesson about supply and demand. Facebook priced 421M shares at $38 in order to raise $16B, but the stock went virtually nowhere in after market trading. The huge amount raised was a lot for the market to absorb and clearly the size was all that could be handled with the stock closing up only $0.23. The market should've learned this from when the opposite happened with other social networking IPOs that priced considerably less amounts of stock at the beginning of the wave. Those stocks had some significant initial pops that led to lackluster returns in the after markets. After a glut of oil has piled up in Cushing, OK, the Seaway pipeline has finally completed work in order to begin sending oil to the coast. The pipeline was originally built in 1995 to send oil to Cushing where it could then be sent to where needed in the MidWest. Of course, this was back in the days when oil wasn't being produced on land. Fast forward to 2011 and domestic production in North Dakota combined with oil from Canada had suddenly clogged up the storage tanks in Cushing. What has always amazed me is what did people expect when Cushing kept building new storage tanks? Last week inventories rose 1M barrels to a record 45M. That is what happens when you build pipelines into a area, build up tanks to store the goods, but then don't have adequate pipelines out of the area! After a 33% drubbing today due to irrational fears over the cash conversion cycle, Velti's (VELT) CEO will present at 8:40 AM E.T at the J.P. Morgan Technology conference. Talk about ideal timing if he has a good story to tell. As posted last night on this blog, the CEO has a good explanation for the higher receivables. The company has now history of writing off bad debt so the concern is clearly overblown. The question is whether he can say anything that soothes the market or if the shorts will press even further if he doesn't provide something of substance. Alex Moukas, Chief Executive Officer will present at the J.P. Morgan Technology, Media and Telecom Conference, to be held at the Westin Waterfront Hotel in Boston, Massachusetts on Thursday, May 17 2012 at 8:40 AM ET. After the close yesterday, Millennial Media (MM) reported its first quarterly results as a public company. A couple of interesting cross currents make this report much more compelling than most quarterly results. First, Millennial Media had a very successful IPO that led to an initial pop of nearly 100%. Since that initial day back at the end of March, the stock has plunged all the way back to the original IPO price. This drop further highlights how investors in the after market typically get burned. Our initial report highlighted how the stock was overpriced back then. Second, the company is now the largest independent public mobile ad network in the market. As so, the results will be scrutinized as to the health of the sector in general. Plus the recent news regarding the inability of Facebook (FB) to monetize mobile traffic will derive some focus. As Facebook (FB) prepares to launch it's IPO this week, the company faces a rather alarming issue. The company continues growing users, but advertising revenue isn't keeping up. Somehow the company has allowed itself to dramatically grow mobile traffic without having a mobile strategy in place. It seems incredible that Apple (AAPL) already has out the 4th version of the iPhone and Facebook still lacks a strategy. Wouldn't the success of the original phone been a great indication that it needed to obtain a plan and in a hurry. Below is a table on the mobile traffic of the leading social networking sites provided by PCWorld. As noted in the article, the average mobile user engaged the app for more than 7 hours back in March. Just look at how you view Facebook. For me, about the only time I visit the site is via my iPhone4. Either I'll post a picture or check the news feed. Hardly though will I go online via my iMac. How could Facebook not have a strategy yet? Monster Worldwide (MWW) closed up 19% on Friday due to more speculation on a buyout. According to a Reuters report, LinkedIn (LNKD) and private equity firm Silver Lake Partners were amongst numerous parties that expressed interest. Investors would be wise to not pay up on such a spike in the stock price. Monster placed itself on the auction block back at the end of February so such news shouldn't be a big surprise. Over the last three months just about every buyout related spike has led to cheaper buying opportunities within the next few days. Even more credulous about today's news was the speculation that LinkedIn would be interested in the company. Why in the world would a fast growing stock want to be bogged down by a deal with Monster? Disclosure: Long MWW. Please review the disclaimer page for more details. After an initial slow start back in November of 2010, the Net Payout Yields model has had solid results while on the Covestor platform over the last 18 months. In fact, since January 1, 2011 the model is up 18.7% versus the 8% gain of the benchmark SP500 (not including dividends). Some other interesting stats provided by Covestor in the Risk Metrics section is that the model is less volatile than the SP500 while obtaining higher sharpe and sortino ratios. These are all measures of risk suggesting this model is less risky than the major average while obtaining higher returns. In general, the model invests in large cap stocks with a $10B+ market caps that have the highest Net Payout Yields which is the combination of dividends and net stock buybacks. The market largely focuses on dividends completely ignoring the benefits of the combination. This model gained a solid 0.8% in April versus a 0.7% loss for the benchmark S&P 500. The model remained strong all month even as the SP500 fluctuated all month. Trade No trades were made in the month of April as existing positions continued to work well with high yields. Top Performers Considering the market was slightly down and the model was only slightly up, not many positions had outside moves. The biggest gainers were Gap (GPS), Travelers (TRV), and Chubb (CB). All three companies had very strong earnings partially helped out by the large buyback programs over the last year. Bottom Performers Just as with the top performers, not many stocks had outside negative moves in the month. The biggest losers were Conoco Phillips (COP), Goldman Sachs (GS) and Wellpoint (WLP) with all three companies losing more than 5%. Conoco Phillips had disappointing earnings that naturally pushed down the stock. The other two had surprisingly good earnings even though the stocks sold off. This shouldn't be a shock to anybody following this blog and our articles published on Seeking Alpha. Not only has SodaStream (SODA) consistently beaten earnings estimates, but the market had priced the stock for a absolute collapse. Even with the stock up 26% today, it trades at absurdly low multiples. 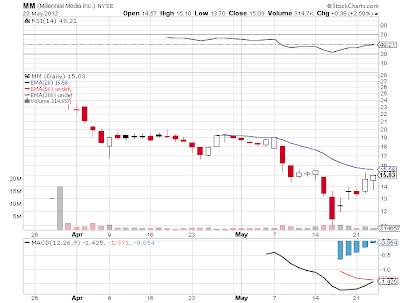 The company could easily earn $3 in 2013 yet the stock only trades at $36 now with 30% growth. This is a recipe for strong stock gains. It was also the first quarter with the report in US Dollars (USD). To most investors, this didn't make a difference but at the edge alot of investors didn't realize that main finance websites reported numbers in Euros. Just something that adds a tailwind to the stock price at this point. The more I review the numbers, the more the plan from OCZ Technology (OCZ) makes sense. The company reported Q4 2012 earnings last week that mostly disappointed investors as the stock plunged 14% the day after the report. 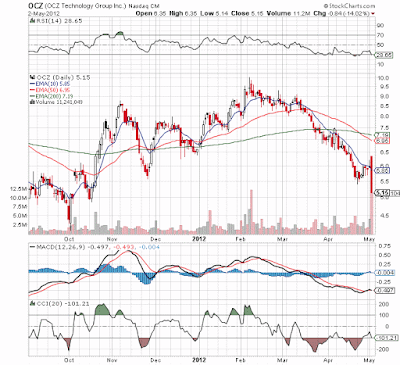 While OCZ Technology dramatically upped guidance for the current fiscal year that started in March, the Street was very disappointed that the company decided to push development expenses forward into Q4 2012 and Q1 2013. So even though the company guided to upward of $700 million in revenue from estimates down in the low $500 million range, investors appear more concerned about short-term losses. What stunned investors was that research and development expenses jumped over 100% sequentially to $13 million, from $6.6 million in Q3 2011. Other operating expenses jumped as well, leading to a nearly 75% increase, or $14 million more. If the company had chosen to growth expenses at the same rate of revenue, it would have been very profitable. Though a lot of focus exists over the copper inventories in China, the LME inventories continue heading south toward the lows in 2007/8. Ultimately this has to be very bullish for copper and construction stocks. Especially considering North America is just now heading into the heavy construction period. The market has been so focused on the Chinese story regarding copper that it has completely ignored that the US is a dominant player in the demand story. At some point we're still expecting a strong US rebound by 2013 and China to continue with strong growth. The market is not prepared for both of the 2 largest users to be strong at the same time. Below is the 5 year chart from kitco.com. As the chart shows, inventory levels haven't been this low since the last bull construction market in the US. Now though, levels are heading that way before construction has even become strong. Did Green Mountain Coffee Roasters Get Killed By The Warm Winter? 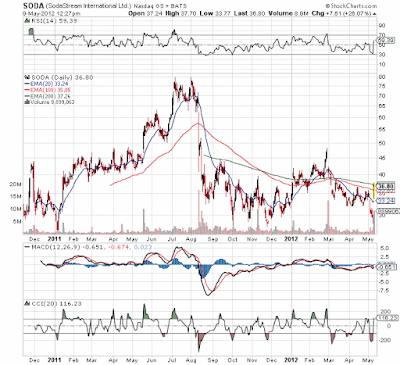 The dramatic rise and fall of Green Mountain Coffee Roasters (GMCR) has been interesting to watch from a distance. 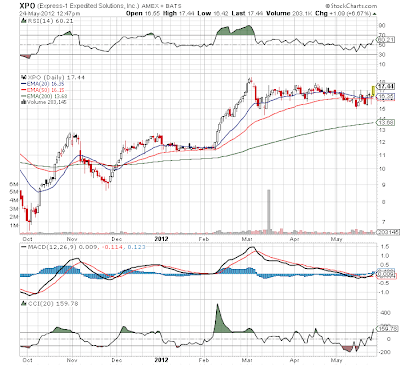 The stock initially soared to nearly $116 last year providing a P/E over 40x the expectations for 2012. Now with the 40% after hours plunge to below $30, the stock only trades at 12x the updated 2012 earnings guidance. After hours, the company reported Q212 results that largely disappointed the market. Though earnings were in-line, sales were dramatically lower than expected and earnings guidance was slightly lowered for the year. These dramatic swings in stock price highlight the emotional and inefficient nature of the markets. Too much focus is placed on the guidance or analyst estimates instead of the actual results. The company reported 37% sales growth in Q2 which is actually very attractive for a 12 multiple. Even the $2.5 earnings estimate for 2012 would still provide over 40% earnings growth for this company. The stock though isn't so forgiving. Last November's IPO, InvenSense (INVN), had lived a charmed life during the roughly six months since its IPO. The stock started trading around $9 and eventually traded as high as $22 in March. For an IPO mostly missing the initial day hype, the after market results were spectacular. On Friday, InvenSense got a rude awakening to the realities of the public market. After reporting solid Q412 results, the company provided slightly lower revenue guidance for Q113. This led the stock to plunge 23% on Friday. The stock went from trading over $18 on Thursday to sub $13 on Friday. In what has been an earnings season of massive selloffs, InvenSense wasn't even the largest sell-off on Friday. Body Central (BODY) saw a 48% decline; previously Riverbed Technology (RVBD) saw a nearly 30% loss on similar warnings (see my article on the plunge of Riverbed Technology). In light of the size of these other sell-offs, maybe the fact that InvenSense was only down 23% can be seen as constructive. Prior to the market open today, the BLS released April jobs numbers that apparently largely disappointed the stock market with the SP500 down 1.5% as I'm writing this post. Below is a summary provided by First Trust. It has long been known that Elon Musk of Tesla Motors (TSLA) was a CEO focused on other ventures. He is currently the CEO and Chief Designer of SpaceX and Chairman of SolarCity beyond his role of CEO and Product Architect of Tesla Motors. I'm tired just thinking about all the work he does. He is juggling so many roles that at some point one has to slip up. Doesn't it? Elon is a brilliant guy and he clearly must have some strong people helping lead these companies. He has gotten farther with both Tesla Motors and SpaceX than numerous other start-ups in those fields.